Another month, another soap club challenge. Amy I really don't know where you get the time and inspiration to keep these amazing challenges coming. I sometimes think to myself how many ways can there be to swirl colours in soap, well I guess the answer to that is the limit of every soap makers imagination. Each one of these challenges has pushed my soaping ability. When I saw the Holly Swirl I thought I can cope with this one, I mean it is just an ITP in a base colour. I had four attempts at this one. The first batch stayed too thin, and my ITP colours were not contrasting enough. The second batch again the base color stayed too thin, but the swirled colours were perfect, although again not contrasting enough. But I was happy with the result as it was a deer hunter camo look that I was after, and it is pretty well what I got. 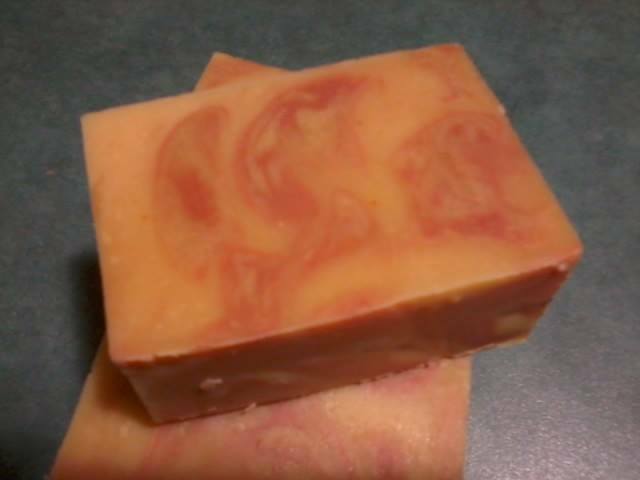 Aussie Bush, scented with EO's of eucalyptus, lemon eucalyptus, peppermint and cedar wood. Deer hunter camo inspired by using venison tallow. 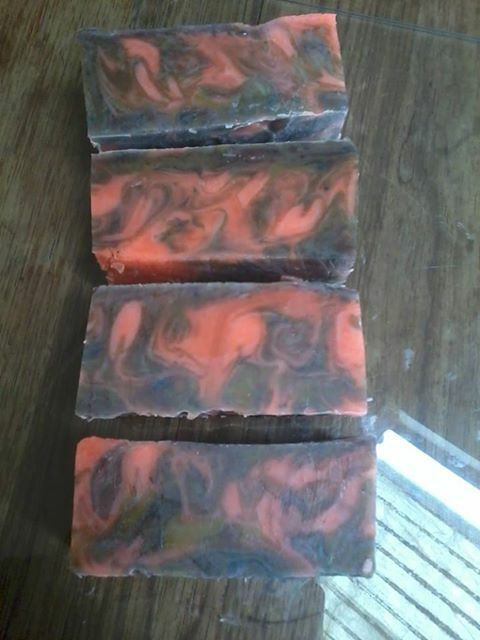 The second batch was the same scent and similar colours. The third attempt was Lavender and Lemongrass Buttermilk soap. I had recently made a big batch of butter as my cows are giving lots of cream and I had to use it up, so I thought to put some buttermilk into soap. I put chilli infused oil into the whole batch, last time I did that it really made a pretty hot pink, but the chilli mustn't have been strong enough. I added pink and yellow clays for the ITP. Again not quite the "holly swirl" but I am still happy with the end result. Finally I needed to make a new batch of one of my best sellers "Summer Garden" scented with EO's of rose geranium, lavender and lime. I thought what a perfect time to do a colour make over. Summer Garden coloured with green clay, ultra violet blue, fizzy lemonade, fired up fuchsia. I was hoping to speed up the trace a tad as I had too many batches that moved too slowly. Of course Rose Geranium sped it up. 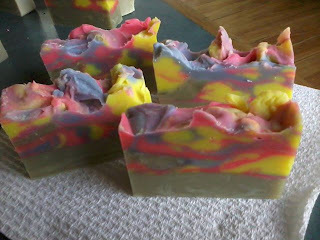 So it still does not look anything like Holly's swirl, but I really like the effect of it for a fun summery soap. I am not giving up, I will master this technique, maybe next time. But now I can't wait to see what every body elses soaps look like. I'm so glad you were inspired!! Yes, they all look great - even if they aren't EXACTLY Holly swirls! :) It must be wonderful to have fresh cream and buttermilk! Your scent blends sound wonderful. They are all very nice soaps. I am with you on this challenge - it wasn't as easy as I had thought it would be! Love your summer garden. Very pretty, nice colour combinations!